The Peachoid was built in 1981 by the Chicago Bridge and Iron Company of steel and concrete. Artist Peter Freudenberg, who likes to work in supersize, was hired to give it its peachy shape. In the TV series, actor Ken Spacey plays the scheming U.S. Representative Frank Underwood. 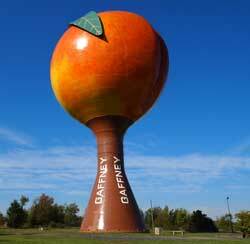 Underwood, who, according to the script, lives in Gaffney, keeps a photo of the Peachoid in his office. In Episode 3 of the series, the characters joke about the shape of the giant fruit, comparing its shape to a human derriere. Fortunately, North Carolina peaches are more appetizing than a South Carolina water tower.